Seattle sound designer Seth Chrisman's work as Widesky takes a refreshing approach to experimental composition that centers around the feelings of natural environments. The four pieces that comprise "Flotsam" harness the inconceivable power of the ocean into sonic representations of aquatic circumstances. Chrisman commands masterful control over field recordings, synthesis and organic instrument tones into an extreme range, harnessing the exhilarating rush of waves pounding against bare skin and the placid tranquility of drifting underwater without gravity's restrictions. The sunken wreckage conjured carries an undeniable beauty that was never possible above the water's threshold, as it becomes one with the sea floor and melts into the reef over the course of forgotten centuries. 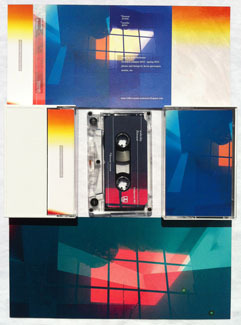 First edition of 50 clear chrome cassettes dubbed in real-time with full-color labels and doublesided printing on heavyweight gloss stock. Second edition of 50 cream cassettes.